Yeh Rishta Manish Suwarna Dadi and others stay at the temple to pray for Kirti’s life. Surekha lies to Naira about Kirti’s birthday surprise. She handles Naira and asks her not to ask more questions. Naira feels terrified by her visions. She gets disturbed and doesn’t know why the bad thoughts are knocking her senses again and again. She learns about Kartik paying at the hospital. She thinks Kirti is going to deliver a baby. She doesn’t know why the family is hiding this from her. She thinks if Kirti’s delivery is the good news. She wants to know the surprise. She gets happy and thinks of meeting Kirti and her baby. She sneaks out of the house without Surekha knowing it. Kartik worries for Naksh and Kirti, and tries to manage the treatment responsibilities of both of them. Just then Naira enters the hospital and enquires about Kirti. She doesn’t pay attention much and gets a close hit and miss with Kartik. Naira gets more signs and wants to confirm if anything has really gone wrong. She wants to meet Kirti’s baby. She tells her baby that maybe Kirti’s baby has arrived in the word. She gets excited to see the newborn baby. Destiny brings her close to see Kirti in the coma state. She gets scared seeing the white sheets in the hospital, which makes her recall her dream. She gets moved when she finds Kirti inside the ICU. She learns that her dream which was disturbing her since long wasn’t meaningless. She can’t believe this and gets panicking. Naira gets in pain. Kartik gets restless and feels Naira is close. Naira falls down writhing in pain. Kartik tries to check if Kirti is fine. He doesn’t see Naira. Naira is taken care of by the medical team. He wants Naira to be fine. Doctor checks Naira and tells her team that she needs to attend her without making any more delay. She doesn’t know Naira’s medical history and faces troubles. Manish and Suwarna conduct the puja for Kirti. They learn that the problems may leave from Kirti’s kundli and land on someone else’s stars. They get puzzled hearing the pandit’s prediction. They want Kirti’s kundli dosh to come on their heads so that Kirti recovers. Naira takes up Kirti’s problems on herself. Kartik loses his attention. He signs the consent form so that Kirti and baby get saved by the doctors. He gets afraid for their lives. Manish, Suwarna and Dadi don’t wish any other person to take away Kirti’s danger. They don’t imagine that Naira will be suffering as well. They continue their prayers to protect both Naira and Kirti. 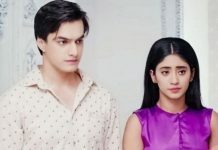 Kartik learns about Naira’s pre-mature delivery. Next articleYeh Hai Mohabbatein Yug-Shagun’s first encounter goes….